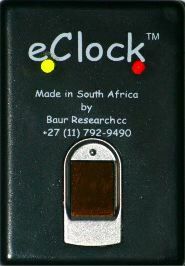 The eClock is an easy to use, extremely fast, rugged and economical computerised clock card machine. Employees clock in and out using their fingerprint or alternatively a touch tag. The eClock will print time-sheets calculating gross pay, holiday pay, PAYE and UIF. Should you require more detailed deductions then it will link seamlessly into your payroll.